Regular readers will be well aware that we've well and truly bought into the Ottolenghi hype. There are nearly 70 posts on here based on Yotam recipes, so we were always going to pounce on his new book when it turned up in the shops. 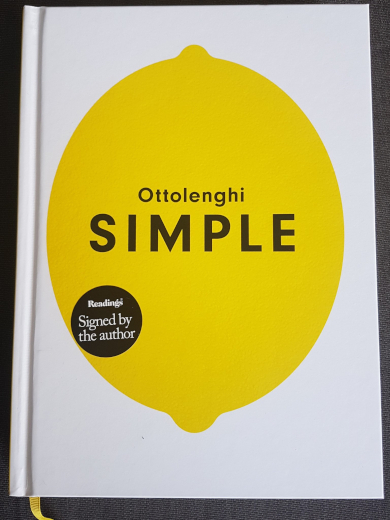 Simple promises the best of both worlds - all the deliciousness of Ottolenghi's recipes without the overly involved processes and ingredients that make them unsuitable for a school night. We couldn't wait to try it out. The first recipe that caught our eye was tofu and French beans with chraimeh sauce. I couldn't help but laugh when one of the first steps in the recipe was toasting and hand-grinding some caraway seeds - only in an Ottolenghi recipe would this qualify as simple. To be fair, it actually was pretty easy and probably only takes half an hour to put together. I loved this simple mix of spicy tofu and crispy beans, but any subtlety in the sauce was a bit drowned out by our hot paprika - we'll soften the edges a bit next time we make it. We followed up with one of the many recipes in Simple that seem a bit more like a side than a standalone meal - Brussels sprouts with black garlic. Again, black garlic is a pricey, niche ingredient and wouldn't turn up in too many books pitched as easy cooking, but this is Ottolenghi after all. We loved this - black garlic has a rich, complex flavour that works brilliantly with the slightly caramelised sprouts. We served it up with fresh bread and hummus, but it would work alongside almost anything. So far, so good with Simple - both of these dishes would be easily whipped up on a work night and both really hit the mark. Don't go in expecting these recipes to actually be simple, but they're definitely a step down from a lot of Yotam's recipes - we'll report back as we try more. Get a medium saucepan of water boiling and add the beans, cooking for five minutes until cooked but still crunchy. Drain and refresh with cold water. Put the sunflower oil into a frying pan and fry the tofu with 1/2 teaspoon of salt. Give it a good 5-10 minutes - you want to get it nice and golden on all sides. Remove from the pan and set aside. Make the sauce by mixing together the garlic, spices and oil in a small bowl. Add this mixture to a hot frying pan and fry for about a minute. Add the tomato paste, sugar, lime juice and a teaspoon of salt. Stir to combine and then add a cup of water to thin the sauce out. Bring to the boil and cook for a couple of minutes until the sauce thickens. Add the beans and cook for another minute and then kill the heat. Stir through the tofu and coriander and serve with rice. Spread the sprouts out on a baking tray and sprinkle over a good shake of salt. Drizzle with olive oil and smush around a bit so the sprouts get nice and oily. Bake for 10 minutes, until golden brown. Crush the caraway seeds in a mortar and pestle. Add the black garlic and thyme and crush some more to make a rough paste. Heat the butter in a frying pan over medium heat. Cook for 3-5 minutes until melted and dark brown. Add the garlic paste, sprouts, pumpkin seeds and more salt. Stir for a minute and kill the heat. Stir through the lemon juice and drizzle the tahini over it all. Serve. I have been wondering about this since I got the ads in my news feed! Thanks for the insight! Are you loving the Ottolenghi podcast? Hi Gill! I've only just been catching up with it this weekend. I like it fine, but I'm not wild about it. Have you been listening, and what do you think?